Recently a reader wrote about receiving “Details: Cleaned” grades from NGC, hoping to get more information about what constitutes a cleaned coin so that she can understand why seemingly unaltered coins are returned without grades. I promised to dedicate a column to cleaning. Some pointers are listed below. Click on any image for an expanded version. 1. You should never clean coins. Conservation techniques, as practiced by NGC’s sister company, Numismatic Conservation Services, are beyond the scope of this post. There are special chemicals and chemical mixes that remove grime and PVC poisoning (a green residue that taints coins in pliable plastic flips containing polyvinyl chloride). We won’t share the chemical-mix recipes or over-the-counter products because more coins have been destroyed by hobbyists than ever have been conserved. 2. Distinguish slide marks from hairlines. Slide marks (caused by coins being removed and put back in albums containing plastic covers) sometimes are confused with hairlines caused by improper cleaning. (To bone up on slide marks, click here.) Bank-bag and stray marks can occur naturally due to circulation. 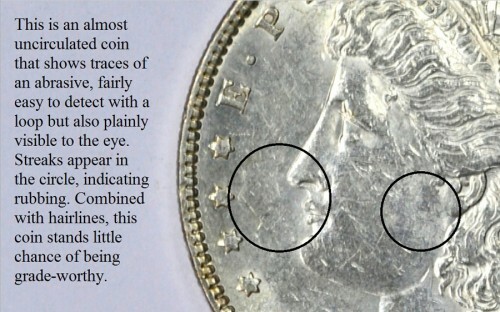 Ones caused by cleaning are somewhat obvious because they leave tell-tale abrasive marks on the surface of a coin. 3. Be able to identify “almost uncirculated” coins from cleaned ones. “Slider coins”–ones that look uncirculated but really grade almost uncirculated (AU50-58)–often are rejected by grading companies as “cleaned,” when they just have traces of wear. 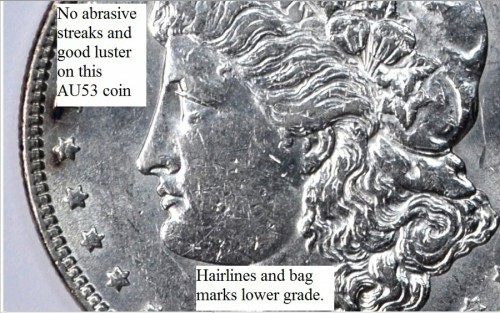 Whereas slide marks (see #1 above) are almost uniformly straight up and down the length of a coin, almost uncirculated coins can have bag marks running in several directions, resembling improper cleaning. 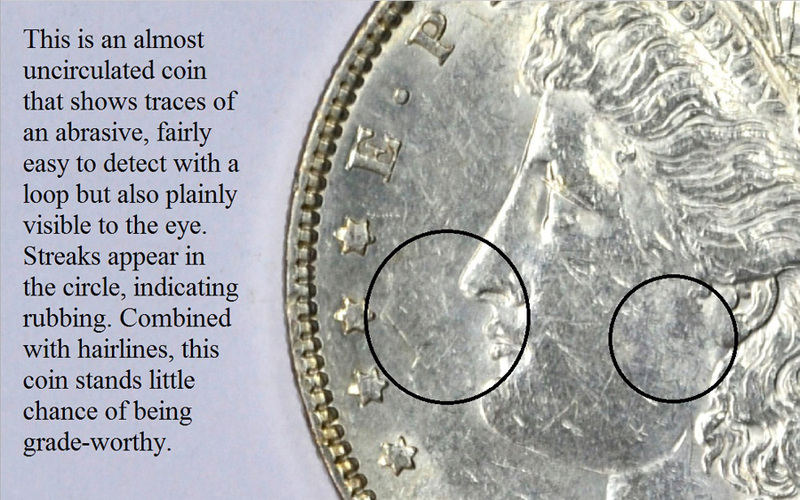 The keys to telling one from the other concern (a) an absence of abrasive hairlines deeper than circulation marks and (b) a uniform amount of luster remaining on the coin’s surface. If there are no rubs on a lustrous surface, it’s probably an AU coin. But again, we’re in the realm of judgment calls. 4. Know when a coin has been dipped. There are several coin brightening solutions that can actually enhance the appearance of a coin if done expertly. But more coins have been destroyed by dipping a coin in such a solution longer than necessary, without washing off the chemical adequately. Those coins have a grainy appearance with a washed-out look, easily discernible from uncirculated coins with cartwheel luster. 4. Identify cabinet rubs. Coins stored in boxes or drawers without protective flips or holders often slide on the wood, causing streaks. These are grade-worthy coins but often dubbed as cleaned. This 1879-S rev. 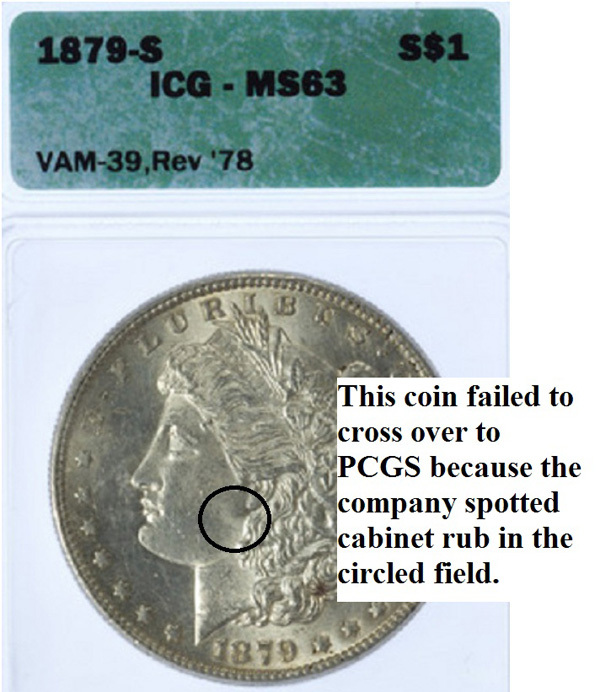 of 78 graded MS63 by ICG failed to cross over to PCGS because of a such a rub on the cheek. 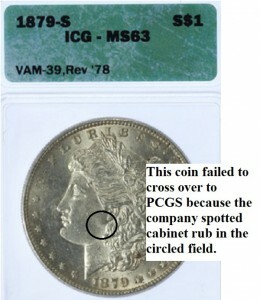 I agree with PCGS, which graded the coin AU58. 5. Some coins are obviously cleaned … with scouring pads (Brillo). Here’s an example. These coins usually are destroyed, unless they are key dates, in which case, you can often buy them at 50% discount. Hobbyists know that one person’s tomfoolery (cleaning an 1893-S Morgan with Brillo) can be another person’s treasured key date coin completing a set. 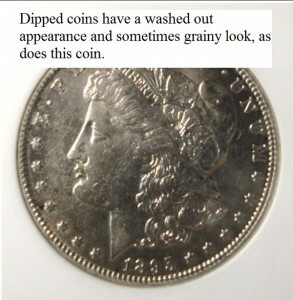 Keep in mind when evaluating coins for cleaning, that some may have a trace of dip or rub and can go either way. If you use a loupe, you may be able to see hairlines caused by abrasives. Or you may see traces of grain caused by dipping solution. These, again, are judgment calls. When you feel sure that a holdering company has made a mistake, submit the coin to a competitor. You just might get a grade. Michael, Very useful article. I have heard long-time dealers say that most 19th century American coins have been cleaned at one time or another. I think the grading services are sometimes a bit too rigid on the cleaning issue, which helps explain the plethora of details graded coins. There are so few original old coins, and if the coin has had just a very light cleaning, it should still retain its value. But if it has been harshly cleaned or had multiple cleanings, and the visible marks you describe, that is another story. Excellent points, as usual, Louis. I also wanted to say that some undipped original Morgans are returned by major grading companies–not because of evidence of cleaning–but because of “Questionable Color.” Just got one of those back. Resent it. Got a new grade: MS64. But all this just speaks to your point about cleaning. THANK YOU! There is no consistency in the grading process despite the claim of the grading company. Someone made a business out of what collectors have been doing themselves for more than the 30 yrs that grading companies have been in business. I saw a post online a while back that PCGS sent back a customer’s 25th Anniversary Set ASE Bullion coin as “Cleaned”. Remember these sets had to be sent in unopened boxes from the mint to get the 25th Anniversary label, so who cleaned the coin, PCGS or the Mint? Yikes. I hadn’t heard about that, John. If you have the URL, please share it. THANKS. I don’t have the correct URL but it was on http://mintnewsblog.com around Dec. (the other Michael might remember). I personally responded to “have the coin resubmitted” or “crack it out and sell for bullion”. Thanks for the tip, John. I’ll look for it! Thanks for the really great in depth info on coin cleaning. Thoroughly enjoyed the article. Thank you, Bill. This is an important topic. We appreciate your visiting Coin Update News. 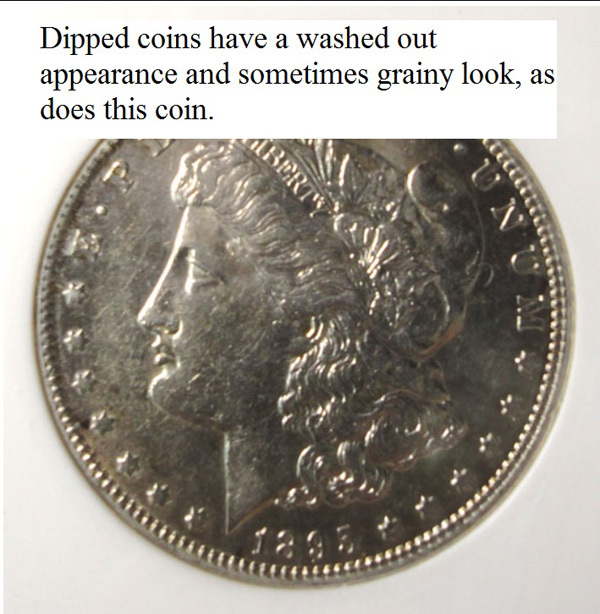 If an individual in the 1880 s went to the bank and made a withdraw and received a new uncirculated Morgan dollar, put it in his blue jean pocket,say for two or more days,then decided to store it away in a box for a grandchild, 40 years latter the grandchild decided to submit it for grading and it returned as AU CLEANED, wouldn’t the friction from rubbing on the inside cotton pocket loose a considerable amount of luster from the high points while maintaining luster on say, the outside outer section around the lettering rim of the coin? We can’t give specific recommendations on coins, as is our policy; but we can state what many hobbyists do when faced with a question of a soiled coin. Don’t clean it. Do send it in. Both PCGS and NGC have conservation services. 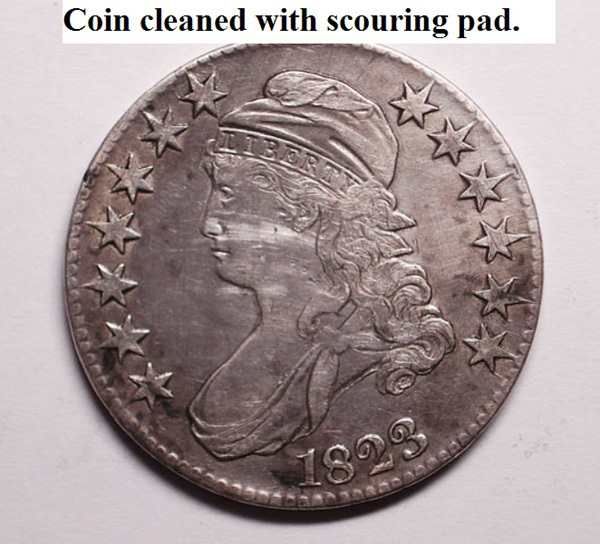 If you believe the coin needs to be cleaned, send it to the conservation service first. Good luck!